Lemons are one of the healthiest fruits out there with wide ranging health benefits. They are chock-full of essential vitamins and minerals and have an extensive use in the culinary world. Whether you like juicing them, squeezing them over your food or making elaborate desserts out of them, lemons can be consumed in thousands of different ways. But, that’s not all – lemons are great for enhancing your beauty too. The bright yellow citrusy fruits are used to improve skin tone and texture, remove dandruff from the scalp, make hair healthier, relieve stress and reduce anxiety, whiten your teeth, and much more. 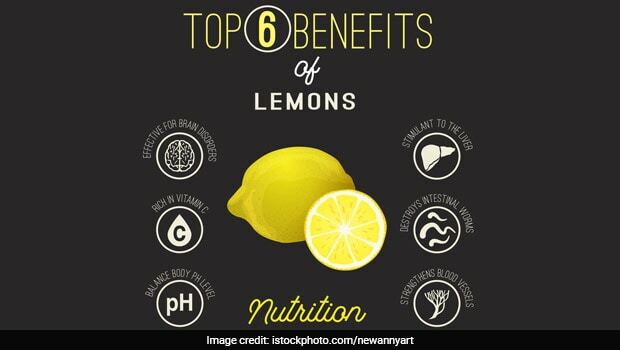 Nutritionally, lemon is extremely rich, with its most incredibly benefits credited to the presence of vitamin C. From reducing the risk of heart diseases, boosting kidney health by reducing risks of kidney stone formation, to fighting a range of infections, lemons improve our health in numerous ways. Lemons are low in calories as well – a 100-gm lemon pulp contains a mere 29 calories, as per the USDA data. Lemon peels are also incredibly nutritious. According to the book ‘Healing Foods’ by DK Publishing, lemon peels are full of antioxidants and also have a high concentration of the fruit’s limonoids. Lemon peels fight free radicals, balance blood sugar levels and also support health of thyroid glands, says the book. Fight Kidney Stones: According to Healing Foods, lemons have the highest concentration of citrate. This is why drinking raw and unsweetened lemon juice daily helps in reducing risks of kidney stone formation. Improves Heart Health: Lemons contain hesperidin, which has been known to reduce symptoms of hypertension in people prone to high blood pressure. Additionally, lemons contain pectin and limonoid compounds, both of which may slow atherosclerosis – a condition where the arteries start hardening. Fight Cholesterol: Lemons may reduce the levels of Low Density Lipoprotein (LDL), which is referred to as bad cholesterol in blood. Detoxifies The Body: Lemons play an active role in flushing bacteria that can cause Urinary Tract Infections (UTI). Reduces Water Retention: Lemons are naturally diuretic and can fight water retention in the body. This is because lemons are alkaline in nature and hence, also help maintain optimum pH level in the body. Improve Skin Health: Lemons have anti-inflammatory and anti-ageing properties, which makes them one of the best ‘skin foods’ out there. Compounds in lemon also scavenge free radicals, reducing inflammation in skin and making it youthful. Boosts Immunity: Due to the presence of vitamin C, lemons are also great for boosting immunity and fighting cold and flu. Carbohydrates In Lemons: Lemons are a low-calorie and a low-carb fruits. According to USDA, a 100-gm serving of lemon pulp contains just 9 gm of carbohydrates. A very small part of these carbs come from the sugars, while a major portion of the carbs is dietary fibre. 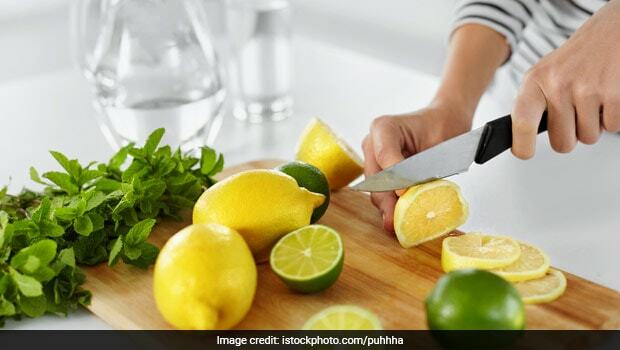 Proteins In Lemons: Despite their numerous and varied health benefits, lemons are not what you would call ‘protein-dense fruits’. 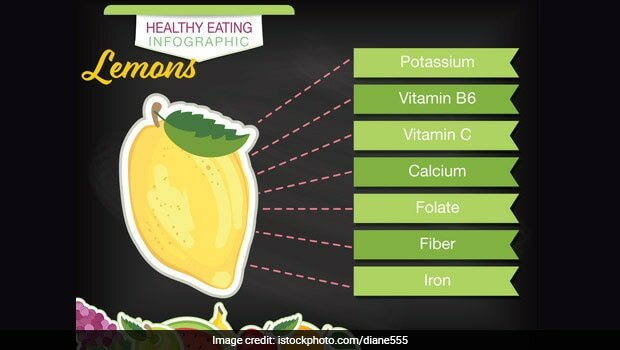 A 100-gm serving of lemon pulp contains a mere 1.1 gm of protein, as per USDA data. However, you can squeeze lemons on a variety of protein-rich foods like chicken, smoked fish, etc. Vitamins And Minerals In Lemons: Apart from vitamin C, lemons also contain vitamins B5, B6, B1 and B2, as well as calcium, copper, iron and potassium. Lemons contain high levels of dietary fibre and this property of the fruit, combined with its low-calorie nature, make it ideal for anyone wanting to lose weight. 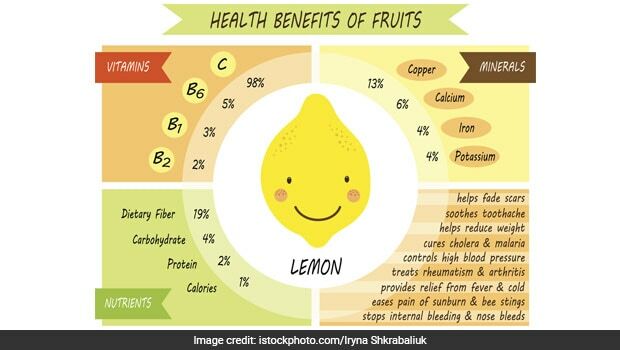 As mentioned earlier, a majority of lemon’s benefits are present due to high levels of vitamin C in it. Due to this vitamin, lemons may help reduce symptoms of rheumatism and arthritis. Due to the presence of vitamin B5, lemons may also help in quicker metabolic processing of food as well as proper formation of hormones. Vitamin B5 also helps in raising levels of good cholesterol in blood. Lemons are perfect for daily consumption if you’re looking to lose weight, moreover, including lemons in your daily diet can improve your overall well-being. There are a lot of merits in squeezing lemon in warm water and consuming it, first thing in the morning.